Haibane Renmei by Yoshitoshi ABe, directed by Tomokazu Tokoro, 2002. Set Apart by Daniel Cronquist, WinePress Publishing, 2009 (ISBN 978-1414112565). In a small town in a mid-20th century Eastern European country is the "Old Home," an orphanage whose residents are known as Haibane, or "gray wings." The Haibane are born from cocoons with no memories of their previous lives. They sprout flightless wings on their backs and wear glowing halos over their heads. The story begins with the "birth" of the newest member, Rakka, and follows her life at the orphanage as she tries to remember who she is and what she is doing there. Couched as a modern fable--never digressing to explain itself--Haibane Renmei is an deeply moving study of character and personal redemption. In his short monograph (running 80 numbered pages), Set Apart, Daniel Cronquist describes Haibane Renmei as "the most Christian anime I have ever seen. [It] has more spiritual truth in it than most American media." His book is an episode by episode analysis of the series from a Christian perspective. Cronquist is not forcing an unwarranted religious interpretation onto the art. According to its writer and creator Yoshitoshi ABe [sic], Haibane Renmei "is not a story about any specific religion; but it is, nonetheless, a religious story" inspired by his own salvific experiences. Though Cronquist approaches the subject from an Protestant perspective, nothing in his analysis should raise hackles in a Mormon audience. In fact, the elements of Haibane Renmei that Cronquist admits "exists outside of canonical theology" would likely be considered even less objectionable by Mormons. Mormons should also be comfortable applying concepts such as the "veil of forgetfulness" and "spirit prison" (though I suspect ABe was thinking more of Catholic purgatory), and the "probationary state" (Alma 12:24) to key plot points. Purgatory (Lat., "purgare", to make clean, to purify): in accordance with Catholic teaching is a place or condition of temporal punishment for those who, departing this life in God's grace, are not entirely free from venial faults, or have not fully paid the satisfaction due to their transgressions. Cronquist expands on the unique metaphor ABe has devised to answer (we assume, though the symbolism is well-nigh perfect) the challenge in John 3:4, "How can a man be born when he is old? Can he enter the second time into his mother's womb, and be born?" The Haibane are "reborn" fully formed from their cocoons. They are all children or young adults (lending support to a Catholic gloss). They live for an indeterminate amount of time and then vanish as mysteriously as they arrived. 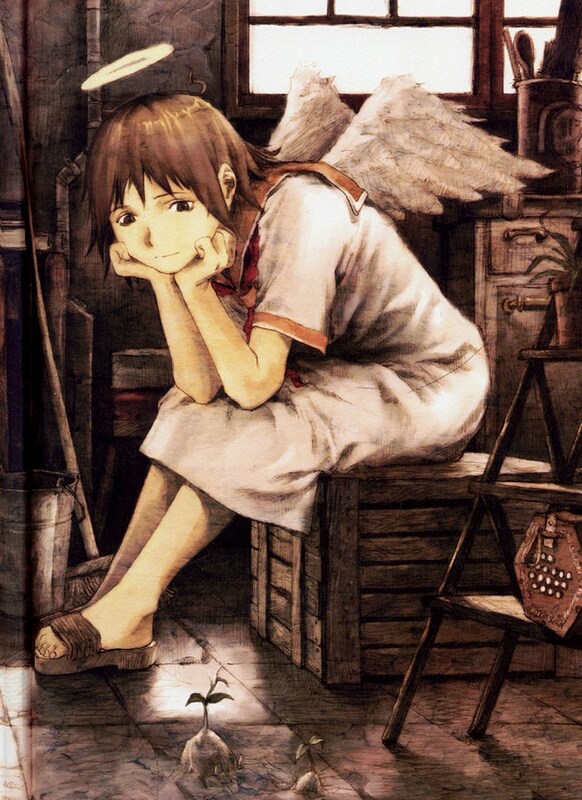 The Haibane work alongside humans, living in the world but not of it. They amass no material goods for they can take nothing with them. Instead, "theirs is a world of spiritual growth--a second chance to move beyond what brought them there." Or as it says in Alma, "a space granted unto man in which he might repent." Once the Haibane have come to terms with the sins that are keeping them grounded, they are are essentially "twinkled" in a "day of flight." Cronquist's exegesis is clear, concise and insightful. Set Apart is organized as a lesson plan with discussion questions at the end of each chapter. It could easily serve as the textbook for a BYU religion course. Frankly, it'd be a lot more substantive than most of the required religion courses I took at BYU. The DVD's U.S. distributor, Geneon, went out of business in 2007, orphaning most of its backlist, including Haibane Renmei. But Funimation picked it up, and thanks to streaming technology, Hulu now carries the entire series. Here is an ideal opportunity for a publisher (say, Shadow Mountain) to pick up the licenses and package the DVDs together with Cronquist's book. When it comes to Christian allegory that succeeds as art and metaphor, with Haibane Renmei Yoshitoshi ABe capably rises to the standard set by C.S. Lewis. Actually, Funimation announced that they had licensed Haibane Renmei in July (Along many other titles), but I haven't read of a release date from them yet. Despite being an atheist, Haibane Renmei is one of my top three most favorite anime of all time (the other two being The Twelve Kingdoms and The Place Promised in Our Early Days). I already had Geneon's release before their demise, but I am hoping for Funi to give it a good release soon. Thanks! This is good news. I see they also picked up the original Hellsing series (which I prefer to the remake), another one of my eschatological anime favorites.